As a chronic insomniac, I didn’t feel the need to set my alarm for the April lunar eclipse. Just the night before I had been awake from 3:45 to 5:30, so I figured that there was a good chance that sometime within the window of the eclipse I would be awake. At my location, totality would last from 2:07 to 3:25 a.m. with partial phases for an hour on either side of that. Surely I would be awake for some of it. I was actually deep asleep around 2:15 a.m. when my phone buzzed beside me three times. Someone who follows my twitter feed was favoriting and replying to my lunar eclipse tweets as he watched the beginning of the eclipse. Roused from sleep, I peeked outside, expecting to still see clouds from the late-season snow that had dropped on us a few hours before. To my surprise, the stars shone brightly. I walked down the hallway to the only south-facing window in my house and stepped behind the curtain. There was the moon, freshly eclipsed, with a lighter patch at the bottom right and a deeper red color toward the upper left. The star Spica, normally a bright light in the sky with a slightly blue tone, was made to look quite insignificant compared to the reddish moon just a few degrees away. To the upper right was Mars, itself a reddish color but on a much tinier scale. I compared the color difference between the moon and Mars, trying to gauge which looked redder. 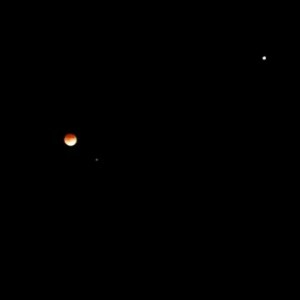 They seemed nearly equal, but as the eclipse went on and more of the whitish light left the edge of the moon, the moon’s red hue became dominant. I took a few pictures through the window with my iPhone, and in the pictures Mars is too small to read anything but white. The larger moon does allow for some color to be seen. The moon was a wide full disk, reaching full phase at 2:42 a.m.; Spica appears in the photo as a light blue pinprick; and Mars is a very small disk of white. After 20 minutes of standing and watching the eclipse progress, the lack of sleep overtook me and I headed back to bed. Here in the US I get another chance to see a lunar eclipse later in the year, when the moon will dip into shadow just before daylight hours on October 8. I stayed up, even tho legally blind . . . saw moon & mars, now I know the blu spec was Spica – had cheap binoc’s, was enuf – got sum shots w/ my camera but NASA channel ran full time live all the way thru – started with a feed from Griffith obs. then switched to U of Ariz, then had both side by side – 1 had an erecting lens the other didn’t, so it almost looked like a rorsarch butterfly, at times – it was a big bang 4 me – haven’t seen 1 that good since I was a kid in Fla – me & my mom nodded off in chaise lounges, but saw it really nice with Dad’s binocs – & he was in bed . . . missed whole thing – God is good.